Every day the Jerusalem team of EAs walk through the Old City to ensure that all is quiet and that there is access to the mosque. EAs often enter the Al Aqsa mosque compound, which, despite the tensions of occupation, seems a serene and lovely place. 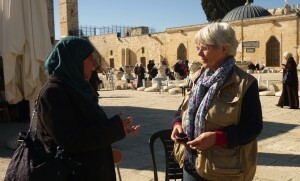 Standing in the Al Aqsa Mosque compound talking with Zarifa, an American/Palestinian woman, about Muslim women at the compound and the recurring tensions and access difficulties there. Monitoring of house demolitions is an important part of our work here. 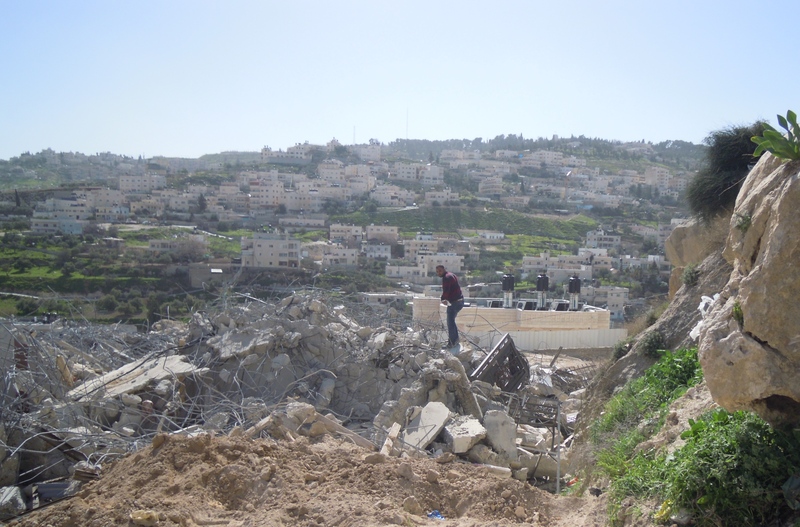 In Silwan, an impoverished neighbourhood in East Jerusalem, there are eighty-eight houses with demolition orders. 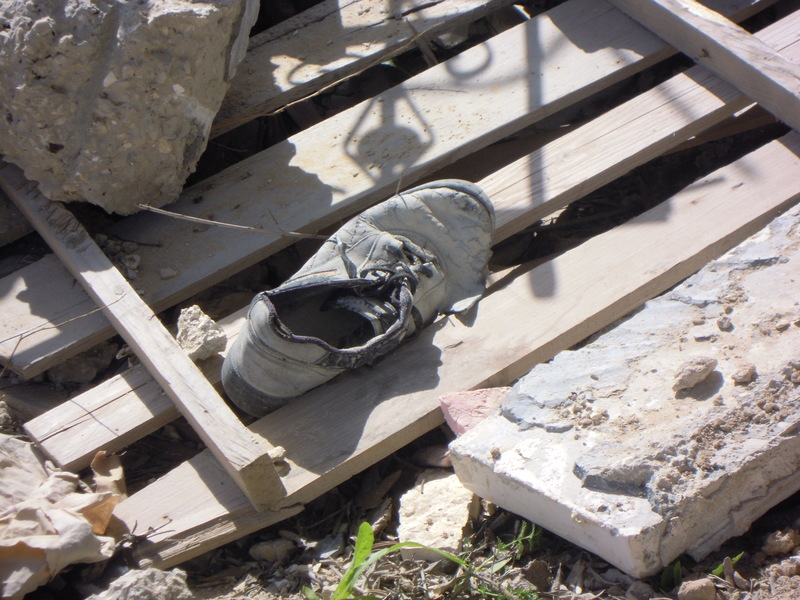 In addition to the destruction of family homes, Israeli authorities have also demolished schools, clinics, animal shelters, and greenhouses. Recently we watched a demolition in progress. Our driver and interpreter, Firas, told us that we must wait until the authorities leave before going to the site. We can see the bulldozers at work just up the hill. Generally no one knows why any house is demolished. It appears to be random. The reason given is usually because they had no building permit, but of those who do apply for permits over 95% are refused. We watch the convoy leave and count nineteen police cars and four bulldozers. Firas tells us that each police car will have five officers. The family must pay for the demolition. We do some quick sums. The cost is 300 NIS (Israeli shekels, about £50) per officer so over 28,000 NIS plus the use of the bulldozers. 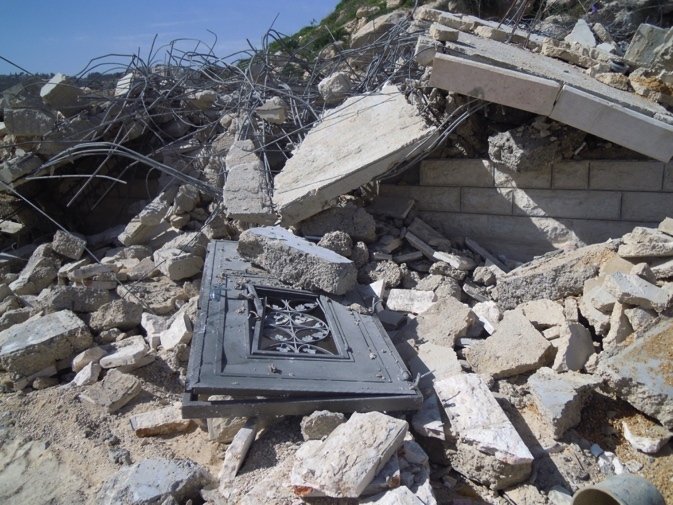 Firas says that most demolitions result in a charge of about 50,000 NIS (£8,500). The phrase “insult to injury” comes to mind. The front door of their now demolished home. It is difficult to convey the shock of the scene — the pile of twisted metal and concrete that, minutes ago, was a 200 square metre house. Ahmad, the owner, says that it was home to his brother, sister, mother, grandmother and seven children. Neighbours come by to offer sympathy. Ahmad says to us, “Everyone angry, sad. Why they do that? This is our land.” There was a demolition order on the house but the case was before the courts. Ahmad says he tried to show the court papers to the authorities but they would not look at them. 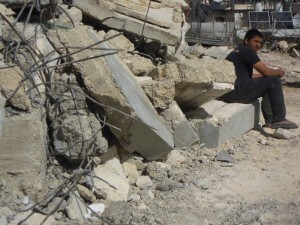 Mahmoud, 15, a nephew, sits beside the rubble. The authorities came at 8:30 a.m. when everyone was in the house but no one was allowed to remove any belongings. We ask what can we do to help. Ahmad says, “Say to Israel we will build again.” This house had recently been completed. The family had moved in to their new home just one week ago. Ahmad standing on top of the remains of his home. Disclaimer: I am participating in a programme with Quaker Peace and Social Witness as an ecumenical accompanier serving on the World Council of Churches Ecumenical Accompaniment Programme in Palestine and Israel (EAPPI). The views contained in this message are personal and do not necessarily reflect those of my employer (QPSW) or the World Council of Churches. If you would like to publish the information contained here (including posting it on a website) or distribute further, please first contact QPSW Programme manager for I-oPt teresap@quaker.org.uk for permission.